(Toronto, ON) Paralympian Tamara Steeves received ParaSport Ontario’s 2012 Female Athlete of the Year Award yesterday at the Evening for Inclusion fundraising event in Toronto, ON. 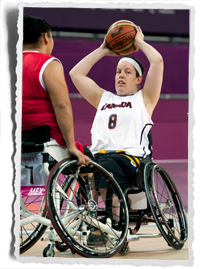 Steeves enjoyed a successful rookie season with the Canadian Women’s Wheelchair Basketball Team in 2012. In addition to reaching the podium at the Osaka Cup and the North American Cup, the native of Etobicoke, ON made her Paralympic debut at the London 2012 Paralympic Games. She was also named to the all-star team at the Women’s Canadian Wheelchair Basketball League National Championship. The Evening for Inclusion is ParaSport Ontario’s signature fundraising event. It is held annually to help support sporting opportunities for persons with physical disabilities and provide assistance in purchasing adaptive sporting equipment to help promote the ParaSport movement in Ontario. The Evening for Inclusion event brings the sporting community for physically disabled people together by providing an opportunity to recognize the successes of fellow athletes, coaches and outstanding team performances throughout the past year. For more information, please visit www.parasportontario.ca.